Learn the skills you need to successfully navigate your power wheelchair in a variety of situations so you can more fully participate in the activities you enjoy. 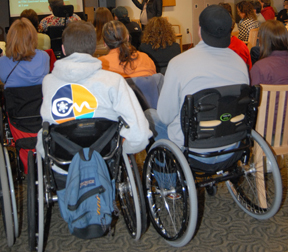 In this presentation, Dave Colescott, PT, of Harborview Medical Center, provides practical tips and guidelines for learning power wheelchair skills, starting with proper positioning and progressing to maneuvering safely in a variety of environments, including mud, snow, crossing tracks and climbing obstacles. Click here to read the written report. Presentation time: 30 minutes. After watching, please complete our two-minute survey! In order to really drive your chair well you need to be positioned well. It is critical that you have a good stable base to help keep your trunk stable. Good positioning supports your pelvis and back so you can move your arm or head (depending on what control you’re using) to drive your chair. Good positioning also gives you good line of sight and supports your extremities well. Power wheelchairs can be controlled by a variety of electronic input devices. Hand-controlled joysticks come in a variety of styles; what’s best for you depends on how much hand function you have as well as personal preference. Conventional “carrot” joystick—the most common type; controlled with fine movements of the thumb and a couple of fingers. Goal post handle—for those with less hand control, this device has a place to rest your hand and use the movement of the arm and shoulder to move the joystick. Ball and dome handles—these offer a different contact area and feel from the column shaped joysticks. Chin joystick—mounted so the user can easily reach it with their chin and use just minimal head movement to drive the chair. Tongue switch—for those with limited control of their heads, this device adheres to the roof of the mouth and the tongue hits the different switches to drive the wheelchair. Head array— motions of the head activate different switches buried within the pads. Sip n' puff —the user either puffs or sips on a tube mounted in front of them to give commands to the chair. Different power bases handle a little bit differently, and one may work better for you than others. Tightest turning radius, excellent maneuverability; good for indoor use and tight spaces. Requires auxiliary wheels (two casters in front, two in back) to limit tipping. Handles obstacles smoothly with front caster suspension. Hill management is good, but traction decreases with steeper inclines, so it’s better to take slopes at an angle. Handles the most like a car, with the largest turning radius and least maneuverability of all power base types. Highest outdoor speed and power. Rough but powerful obstacle handling. Anti-tippers needed with steep inclines. Good maneuverability, smallest front turning radius. Back end fish tails at high speeds, difficult to learn backing up. Stable uphill/downhill without anti-tippers, but loses traction with steep incline. Smooth obstacle handling, but there is a possibility of getting stuck on the middle portion of the frame (high centering) when going over some obstacles. For example, certain bumps or curbs could potentially create this problem. Turning radius— Front wheel drive allows you to make a tighter turn than the other power bases. Foot rest vs. foot plate: Foot rests stick out a little farther and wider than foot plates, requiring a larger area for turning. Counter and table tops often aren’t high enough for a power wheelchair to roll underneath. While power chair seats are getting lower, this is still a consideration when thinking about clearance under desks and tables. Although they are less of a problem than with manual chairs, thick carpets can still slow you down, and users may need to use lower power settings for this. These days, however, power wheelchair programming has special turning, acceleration and torque features that can give you more power in the lower drive settings, so you can maneuver more easily on carpet. Approach the slope straight on with enough momentum to carry you up. For steep slopes, it is best to lean your trunk forward for balance, assisted by a power recline or tilt feature as needed. Take it slowly; weight is going to pull you downhill. Lean back, assisted by the power tilt/recline feature. This involves going perpendicular to the incline. For individuals with limited control or using a latch switch system (e.g., sip ‘n’ puff systems) there are programming features that aid in driving straight. Curbs — Standard curb heights are anywhere from three to five inches, and most standard chairs are limited to climbing over obstacles of approximately three inches due to the clearance of the wheelchair frame. Railroad tracks — take them straight on to avoid risk of catching a wheel and flipping over. It’s a good idea to use seat belts for this. Make sure sand is packed or firm so your wheelchair doesn’t sink. Maintain medium to high speed. Fatter tires are better for this. Watch out for rising tide! Have someone with you for emergencies! Consider a specialized chair if you plan on spending a lot of time on the sand to avoid getting sand in the motors or electronics of your power chair. Avoid depths of two inches or more. Great care is needed to avoid damaging the electronics or getting stuck. Use smooth acceleration and steady speed so you don’t lose traction. Maintain tire pressure and tread to be safe on slippery surfaces. Keep speeds low and avoid crossing slopes at an angle. Handy to have someone jump on the rear for traction when needed. Watch out for ice that might be underneath snow! Length – the shorter a ramp is, the steeper it is, requiring more torque and skill in driving. Width – usually there are only a few inches to spare on either side, so proper programming is helpful. Response or Sensitivity features can be very useful on ramps because they affect how responsive your joystick is to your commands. Taking lifts requires some practice to become skilled. You may need caregiver assistance at first until you get comfortable with it. 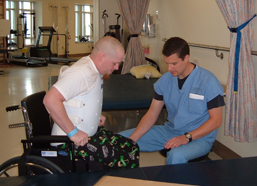 Metro offers a travel training program so you can practice using their lifts with assistance. 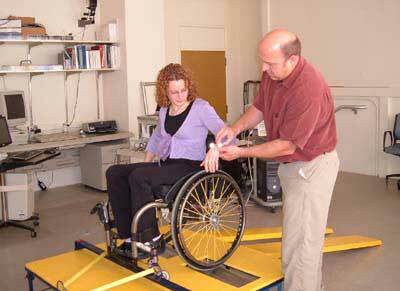 Programming feature of Response or Sensitivity can be adjusted to make it easier to control the chair. Door clearance—make sure you know your head-to-ground measurements so you can fit through the door.. Length of chair—need to know the turning radius for inside van maneuverability. Frequency—usually every night. If you are plugging in daily and your charge is not holding, it may be time for new batteries. Height of charging station—if possible, set it up so cord is easily reached from a seated position in the chair. Protect from the weather. This is an electronic device, so you should protect your controller in the rain with a plastic bag, or use a big poncho that covers everything.